Even though I wasn’t there in person, I have to thank Popmatters music scribe Jennifer Kelly for putting me right in the thick of things at the SXSW music festival this week in Austin, Texas. I especially enjoyed her detailed reporting and pictures during Julie Doiron’s set as she tells how the elements factored into Doiron’s performance. 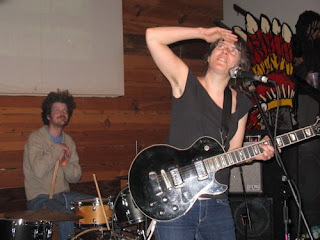 “By the time Julie Doiron sets up, a pipe in the Mohawk’s ceiling has started to drip steadily, creating that difficult combination of water and electrical equipment. “It’s just water,” the venue’s guy assures her, after someone raised the question of sewage, but water is bad enough. Doiron’s a little rattled. She’s just changed a guitar string on a stool near the bar (with two Japanese teenagers videotaping the whole event), and now she thinks her guitar is “brutally out of tune.” She’s just like her music, though, fresh, natural, unpretentious, and so clearly a really nice person who doesn’t like to make trouble. She apologizes during nearly every song break, which isn’t necessary at all, she sounds fine, better than fine actually, in the full-rock mode of I Can Wonder What You’ve Done with Your Day. This account might only be a few lines long, but it’s pretty meaty with easy, silly puns and powerful metaphors. So then the “dripping” was just more than an unexpected plumbing problem. It appears to have underscored how an artist, and their audience, get tested to adapt to the challenge of performance adversity. You just never know what’s lurking under the surface of the live concert experience. Check out the other Popmatters scribes as they cover the rest of SXSW.